Did you suffer from adverse health effects after being exposed to Teflon? A chemical once used to make Teflon, called PFOA, has been linked to serious adverse health conditions, including cancer, by a science panel and numerous other studies. If you or someone you love were exposed to Teflon or its former component PFOA you may be entitled to financial compensation. Call the lawyers at National Injury Help today to see if you qualify for a Teflon lawsuit. There may be substantial cash awards from claims and settlements from a Teflon class-action lawsuit. Teflon is the trade name of a man-made chemical called polytetrafluoroethylene, or PTFE. It belongs to the class of plastics known as fluoropolymers and is extremely slick and slippery, has a high melting point and is nearly indestructible. PTFE’s ideal properties have ensured its inclusion in thousands of different consumer and industrial products from non-stick pans to water-proof rain jackets. Teflon was manufactured by chemical giant DuPont until 2015, when it spun off its Performance Chemicals division into a new independent company called Chemours Company. Until a few years ago, Teflon was made using a surfactant called perfluorooctanoic acid, or PFOA. Like Teflon, PFOA was used in thousands of different products until a high-profile lawsuit brought to light the substance’s potential dangers. In the early 2000s, the Environmental Protection Agency (EPA) began investigating the safety of PFOA after industry studies surfaced showing the chemical was potentially harming factory workers and the surrounding community at DuPont’s Washington Works factory in West Virginia. Studies have also linked the substance to birth defects, liver, breast and pancreatic cancer in lab animals, as well as prostate, bladder and ovarian cancer in humans. PFOA is prolific in the environment. Traces of the toxic material can be found in the blood of nearly all people worldwide, in the soil, air and water of communities nationwide, and in the bodies of animals living as far away as the Arctic. PFOA never biodegrades, instead it accumulates over time in the environment and in the body. The potential dangers posed by PFOA and Teflon have been addressed by several national and international agencies. The International Agency for Research on Cancer, or IARC, classifies PFOA as “possibly carcinogenic” to humans, and some studies have linked the chemical to birth defects, liver, breast and pancreatic cancer in lab animals, as well as prostate, bladder and ovarian cancer in humans. The EPA also issued health advisories in 2009 and 2015 setting the safe limit of PFOA in drinking water at 70 parts per trillion, though the advisories are non-enforceable. 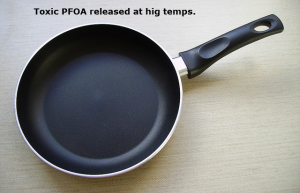 Teflon is now produced without the use of the cancer-causing chemical PFOA. It is, however, manufactured using similar compounds which many scientists argue are just as detrimental as PFOA. Teflon itself, when heated to 660°F, gives off fumes that can cause polymer fume fever, or Teflon flu, in humans. Symptoms of polymer fume fever are flu-like chills, headaches and fevers with chest tightness and mild cough. The fumes that Teflon gives off kill certain birds at even lower temperatures. Instances of birds dying from Teflon pans heated to just 325°F have been documented and bird owners were advised by DuPont itself to be extra vigilant when cooking with non-stick pans around their pets. Teflon & PFOA Exposure: Who, what, where? Virtually everyone is at risk of Teflon and PFOA exposure and virtually everyone already has traces of PFOA in his or her blood. People are exposed to PFOA through food, water and air. Though exposure is usually relatively low, the fact that PFOA never leaves the body and accumulates over time has raised concerns that even small amounts of exposure could be detrimental. PFOA exposure has been linked to certain cancers and other health conditions. While everyone is at risk for exposure to Teflon and PFOA, people working at or living near the factories where Teflon and PFOA were manufactured are at the greatest risk of adverse health effects due to exposure. Though PFOA is no longer produced in the US, compounds similar to the substance are still being produced in vast quantities and used in thousands of products every day, including Teflon. Teflon factory workers and nearby communities are still being exposed to these potentially dangerous chemicals every day. 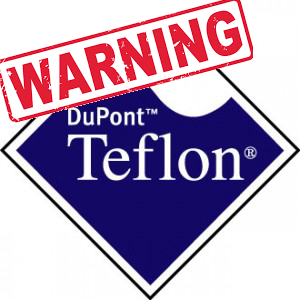 Teflon has been manufactured at several different DuPont factories since the product was first invented in 1938. DuPont also manufactured PFOA after the year 2000 at a North Carolina factory. The existing factories are now owned by Chemours Company. DuPont has faced thousands of lawsuits regarding its Teflon products and PFOA exposure since the late 1990s. In 1999, a Cincinnati lawyer filed a lawsuit on behalf of a small farmer who lived near DuPont’s Washington Works plant in West Virginia. The farmer, named Wilbur Tennant, claimed the stream where his cows drank was being poisoned with PFOA from the DuPont factory. During the discovery phase, Tennant’s lawyer uncovered damning evidence against DuPont proving the company had dumped over 7,000 tons of PFOA into a landfill near Tennant’s property, and that the waste was poisoning the local water supply. DuPont settled the lawsuit for an undisclosed amount of money in August 2000. Shortly after DuPont settled, the same Cincinnati lawyer filed a class-action lawsuit on behalf of the 70,000 residents living near the West Virginia factory whose water supplies were contaminated with PFOA. In 2004, DuPont settled the lawsuit, agreeing to pay $70 million and to install filtration systems in the affected water districts if they wanted them. The company also agreed to fund a scientific study to determine whether there was a probable link between PFOAs and any health conditions. Before any of the 70,000 plaintiffs received their settlement checks, they gave blood samples to members of the science panel set up to study the effects of PFOA. In 2011, the science panel came back with their findings: PFOA could cause kidney and testicular cancer, pre-eclampsia, ulcerative colitis, thyroid disease and high cholesterol. After the science panel came back with its findings, roughly 3,500 personal-injury lawsuits were filed against DuPont alleging PFOA-contaminated drinking water led to diagnoses of one or more of the above-mentioned health conditions. The lawsuits were grouped into a multidistrict litigation, or MDL, in Ohio federal court and five cases were chosen to be tried first beginning in late 2015. The first in this series ended in October 2015 with a $1.6 million award to a woman diagnosed with kidney cancer. The second ended in July 2016 with a $5.1 million award to a man diagnosed with testicular cancer. Two days after the jury handed down its July verdict, it awarded the man another $500,000 in punitive damages. DuPont was told to brace for a 40-trial-per-year pace beginning in April 2017, meaning it could take about 90 years to hear all 3,500 or so cases. At the same time DuPont was fighting the class-action lawsuit, the Environmental Protection Agency filed suit against DuPont alleging the company failed to disclose health data regarding PFOA under the Toxic Substances Control Act. The company settled the lawsuit in 2005 for $16.5 million – the largest administrative fine obtained by the EPA at the time. A large class-action lawsuit was also filed against DuPont in 2006 claiming the company failed to disclose potential health dangers when using Teflon-coated cookware. If you or someone you love were exposed to Teflon or PFOA and were injured as a result, you may be entitled to financial compensation. The legal team at National Injury Help is currently accepting calls from those injured as part of the investigative process into possible lawsuits. Call National Injury Help today at 1-800-214-1010 for a free case evaluation. Teflon class action lawsuit claims and settlements page updated on April 5, 2019.